You can now view and use a free copy of “The Plant Detectives Manual” described here, including pdf and ePub, by clicking here. I have been very fortunate to be able to share my knowledge and excitement about plant biology by engaging in teaching activities during all stages of my scientific carrier to date. Shortly after I started my post-doctoral appointment with Professor Barry Pogson at ANU, I was offered the opportunity to participate in the development of a practical session for the second year undergraduate plant physiology class “Plants: Genes to Environment” (BIOL2121). The course had been taught by Dr Adrienne Nicotra and Dr Ulrike Mathesius for several years, with positive reviews, but in 2008 a desire to increase the course’s immediacy and accessibility in terms of research-led education had given rise to a thoughtful redesign and more team-based approach. One of the guiding principles in this redesign was an awareness that, if they are to tackle effectively the challenges of food production and biodiversity management in the face of climate change, the next generation of plant science graduates will need to be able to think creatively in the context of high quality knowledge and investigative skills. Having just recently started working with the model plant Arabidopsis thaliana, I soon realized that this system could be an excellent tool for teaching important concepts of plant biology. 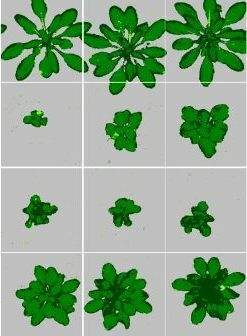 Not only is there a wealth of basic knowledge about the physiology and genetics of Arabidopsis, but also a wide range of protocols are already available, as, even more importantly, is a large collection of mutants. Seeing the potential of using my own research tools with Arabidopsis thaliana as the model plant, I volunteered to design a comprehensive, research-led practical module to teach basic concepts of plant biology by linking gene mutations to physiology. So, from 2008 to 2010, I took on the role as coordinator of all the course’s practical sessions, which required the design and implementation of new experiments, the development of a detailed laboratory manual, lecturing on practical aspects, and the supervision of practical sessions. To do all this in a coherent and authentic way, I developed the research-centred Plant Detectives project, which engages students with the puzzle of pinpointing a plant’s genetic mutation. In groups of 4 or 5, students create their own detective teams to conduct eight weeks of intensive laboratory-based research. 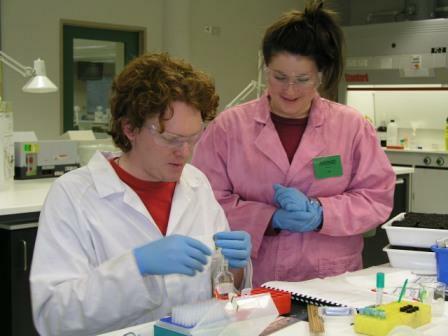 Using cutting-edge laboratory techniques, the students must apply the theoretical knowledge newly acquired in the course lectures to investigate the effect of an unidentified gene mutation on the physiology, form and environmental response of the individual Arabidopsis mutant assigned to their group. Each team of students receives wild type seeds as well as seeds of an undescribed mutant. The students are then guided through a series of procedures in their effort to identify the mutant and explain the effect of the mutation on form and function under a range of growth conditions. 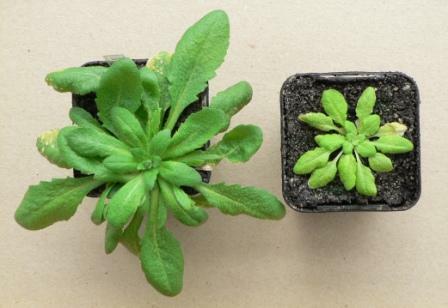 Students have to “discover” the genetics basis of the differences between normal (left) and mutant (right) plants. The mystery is quite real as we use a double blind approach: only I (the practical coordinator) know which team has which mutant, or which tests may prove conclusive. This strategy was developed quite deliberately, based on educational research that suggests students are motivated to sustain the necessary investment of time and intellectual effort when their interest is sparked by a genuine puzzle. Students report that this approach really helps them understand the links between theory and practice, and encourages them to start thinking like scientists: curiosity and creativity come into play as they negotiate with team members, design their own investigative pathway, and assess their various results in the search for clues. To maintain a focus on the element of fun, although we never give them ‘answers’, we do limit the risk of students becoming frustrated or going off track by providing frequent feedback and excellent technical support. A key element of that technical support is the “Plant Detectives” Manual (Estavillo et al.) which I developed to provide students with detailed, well-explained, step-by-step protocols that allow them to access the latest investigative techniques in plant science. The Manual is based on my own experience thorough years of research and teaching in this field, and is tailored to allow a relatively easy identification of mutant phenotypes. The rule of thumb for the course was to choose mutants that will show phenotypes clearly different to those of the wild type in at least two out of the many tests performed. This concept is easily adaptable to other systems or to the specific skills of the teaching staff. After significant interest from universities in and outside Australia, the manual is currently being prepared for publication to allow it to reach a wider audience. Before each laboratory session, students complete an online quiz (for which they gain course marks) as preparation for that session’s topic, approach and purpose. The laboratory session itself starts with sets of cross-team discussions (one member from each team). The aim of this is for the students to share their findings across teams and compare results from the previous sessions, reflecting the way in which scientists collaborate. Instead of classic demonstrators, we use paid Peer Mentors, who are enthusiastic students from the previous year’s cohort identified through a selection process. The Peer Mentors facilitate the cross-team discussions and work closely with laboratory groups to bridge the gap between researcher and student. In this process, the Peer Mentors also benefit, as they are taught by the teaching team how to facilitate critical thinking rather than reveal ‘answers’. In this way, they develop further as plant scientists themselves and gain valuable teaching experience early in their career, with many moving into Honours or other research activities. Students use cutting-edge imaging techniques to study plant growth. Of course, for this practical approach to work, the students must have the required theoretical background. For this reason, the Plant Detectives project has a delayed start to give emphasis to the theory in the first weeks of the course. During that time, a highly interactive lecture/discussion format ensures that students gain high levels of understanding without teaching staff sacrificing the depth or breadth of research knowledge they are aiming to convey. Students are required to prepare themselves for each class with a set of online readings and focus questions. In the ‘lecture’, they discuss the topic in randomly assigned groups (which vary each lecture). One member of each group is then nominated to respond to the lecturer’s questions. In this way, we use the lecturer’s limited time to target learners’ attention most effectively on the concepts which students find most difficult. We find students are more willing to admit to confusion in small groups, when they can see their peers struggling with the same question or concept. Even better, one student in a group may voice their thinking in a way that clarifies the confusions of his or her peers. We have found that, during the semester, student responses often improve markedly as they engage with the topics and develop confidence in speaking out. This approach does not make challenging topics any easier to communicate, and still requires all four lecturers (each an established plant science researcher) to be fully confident in their own knowledge. However, the evidence from students’ assessment tasks shows that the resultant learning by students is deeper and more holistic, and the lecturers all report that the teaching effort feels very worthwhile. The Plant Detectives project concludes with each group using its own data and public online resources to identify the unknown mutant phenotypes, as far as possible, and then presenting those findings in a course symposium. Each student then writes an individual paper formatted in the style of the journal Functional Plant Biology. Each year, the symposium and papers prove tremendously rewarding for students and staff alike, as students demonstrate that they have genuinely developed the ability to link mutation to biochemistry, and hence to the function, form and performance of their plants. The innovative “Plant Detectives” module has had a positive impact in the learning experience for many undergraduate science students at ANU, with particular benefits accruing from developing technical skills and experiencing the workings of an authentic research laboratory environment. This research-led approach has also enriched the value of the class and recognition among research and teaching peers. Several academics from Australian and overseas universities have requested the “Plant Detectives” Manual so as to introduce aspects of it into their own teaching., The teaching team has also received several teaching awards, including Citations for Outstanding Contribution to Student Learning from the ANU Colleges of Science and ANU Vice Chancellor in 2009, and from the Australian Learning and Teaching Council in 2011. “The practicals […best part of the course]: I learnt a lot of new techniques and a lot about how to present data and write lab reports. I’ve done a large number of science courses and never learnt as much about these as I did here. Despite the considerable amount of initial preparation for the delivery of the class (especially the practical section), the outcomes have been well worth it, for staff and students alike. I would like to propose that part of the beauty of the BIOL2121 model is that it has the potential to be applied to any plant science or related course, because it uses readily available plant material, and can be modified to the equipment available and the specific expertise of the teaching staff. Being part of such a creative and exciting teaching team has been the highlight of my teaching experiences so far. I would like to thank Adrienne Nicotra and Uli Mathesius for their supervision and for giving me the possibility to participate in the class (and “experiment” with my teaching ideas). I am also very thankful to Dr. Beth Beckmann. From 2008, Beth supported the BIOL2121 teaching staff as an educational designer. She suggested many of the new ideas, pedagogical concepts and learning activities that we incorporated and trialed, and organized many student and staff formative and summative feedback sessions that contributed to improving the delivery of the course.